With fierce competition in the smartphone world every company is struggling to make a phone that stands out from the crowd. The new Blackberry Passport attempts this with its unique square design. The full HD 4.5 inch IPS LCD display is reinforced with Corning Gorilla Glass and the body strengthened with stainless steel. The screen has an impressive 1440×1440 resolution and a pixel density of 453ppi. Blackberry has focused its selling strategy on the wide screen, which now holds 60 characters per line instead of the smartphone usual of around 40. This makes it perfect for reading e-books and documents. As with most recent Blackberry phones the Blackberry Passport has a touch screen and a QWERTY keyboard. 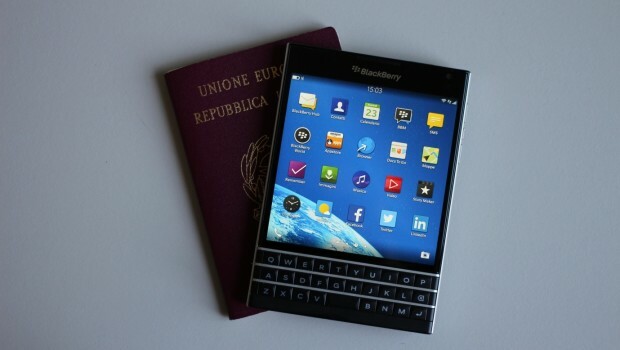 One of the improvements of the Passport is the new Blackberry 10.3 OS. This new system is focused on the Blackberry Hub which compiles all your notifications from social networking, e-mail, and such into one place. There is also the Priority Hub, which cleverly learns the interactions you perform most and collects them into a single stream. It also features Blackberry Blend which allows users to install Android apps from the Amazon store onto their phones. The Blackberry Passport has a 13 megapixel back-facing camera with LED flash, optical image stabilisation (OIS), auto-focus, geotagging, high dynamic range (HDR) and face detection. There is also a 3 megapixel front-facing camera that can record at 720p, perfect for those who like to video chat. For those who like old-fashioned non-video chat Blackberry has bought in a few clever little additions. There is a microphone in the phone’s earpiece which is meant to measure the sound pressure in your ear and adjust the phone’s volume to the perfect level. Blackberry has also added their version of Apple’s Siri, Blackberry Assistant. Time will tell whether this particular voice command system will actually be able to recognise anyone’s commands. The Blackberry Passport runs on 2.2 GHz quad-core Snapdragon 801 CPU. It comes with 3GB RAM and 32GB of internal memory, alongside this it can take up to a 64GB micro SD card. A very practical improvement is the 3450 mAH battery which Blackberry claim will last up to 36 hours. It has Bluetooth 4.0LE, NFC and 8012.11 b/g/n+ac Wi-Fi and supports Miracast and Wi-Fi direct. The new Blackberry Passport is available now for £529 RRP.